In Western North Carolina, chances are you can’t go far without seeing a mountain. While the mountains are awe-inspiring on an almost daily basis, I was not fully aware of the historical, industrial, or geological importance of the Appalachian Mountains. After doing further reading on the subject, I felt many would find this information as fascinating as I do. While it may be true that I am easily drawn to random scientific facts, some of these things could very well change the way you view the Appalachian Mountains. Separating the east coast from the mid-west, the Appalachian Mountains were first formed around 300 million years ago when the modern-day continents of Africa and North America slammed together. Like an immense car crash, this collision caused crumbling and rising of the earth’s crust in the area. In the millions of years that followed, these mountains remained in place as the continents broke apart and formed the landmasses we are familiar with today. The Appalachian Mountains are some of the oldest in the world and were once as tall as the Alps, however they have been slowly whittled down through erosion. Throughout their history, they have acted in weather manipulation, been a source of refuge to a large number of different species, and they have gifted us with a wide variety of natural resources. 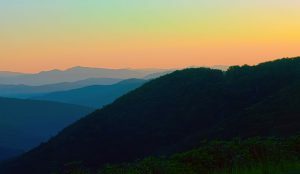 The uniquely vibrant Blue Ridge mountain environment is due in large part to the mountains themselves. As wind makes its journey around the globe, mountains act as ramps that drive the winds up into colder altitudes. In general, for every 1000 feet in altitude the temperature drops up to 5 degrees. This causes moisture in the air to condense into clouds and precipitation. The mountains effectively wring the moisture out of the winds. Since the Blue Ridge Mountains have been in place for millions of years, they have been able to make the surrounding landscape wetter for a long time and in consequence, established an extremely lush environment. This moisture has also worn down the Appalachians, allowing for the minerals within to be more easily discovered by humans. The Appalachian Mountains are relatively rich in mineral diversity- our area has been known to produce rubies, sapphires, emeralds, garnets, and quartz as well as gold, lead, copper, and zinc. Many of the Appalachian Mountains have also been tapped for coal, oil, and natural gas deposits. It is believed that there were even several types of small tyrannosaurs that once used the ancient mountains as their exclusive hunting ground. It’s no surprise since according to the Blue Ridge National Heritage Area, the mountains of North Carolina are home to more species of plants than any other area of similar size in North America. As urbanization has slowly spread through the country, the mountains have served as the last refuge for many imperiled species such as bear, wolves, panthers, mink, and otter. The mountains also harbor populations of salamanders, speckled trout, and hemlocks that are struggling elsewhere. These landscapes are in the process of recovering from damage incurred through extensive logging and coal mining in the early 1900’s. Chestnut trees, once a major part of the Appalachian landscape, were also essentially wiped out in the early 1900’s due to a fungal disease. The battle continues: many of our native forest species are currently under attack by invasive pests and diseases, such as the wooly adelgid and beech bark disease. Fortunately, the Appalachian Mountains’ ability to support a wide variety of life might give scientists just the time they need to figure out some of the solutions to these problems. This article was originally published in The Sylva Herald in Sylva, NC. Some really good info , Glad I observed this. “Prayer indeed is good, but while calling on the gods a man should himself lend a hand.” by Hippocrates. Thank you again, we appreciate your kind words.